A 50-year-old woman who died in September after being injured in a car crash has been confirmed as the 11th U.S. victim of defective Takata airbags, according to the National Highway Traffic Safety Administration (NHTSA). The woman was driving in a 2001 Honda Civic when she collided head-on into a pickup truck in Riverside County, California. She was rushed to a hospital where she later died from her wounds. Police reports state that she was wearing her seatbelt at the time of the accident. Her vehicle had been included in multiple recalls since 2008. However, the woman did not purchase the car until 2015, and it is unclear if she received any of the more than 20 recall notices that Honda has said it issued to the car’s registered owners. There are no records of repairs being made to the vehicle in relation to the defective airbags. The defect in the Takata airbags lies within the chemical used to detonate the airbags upon impact. The chemical, ammonium nitrate, deteriorates when exposed to long periods of heat or humidity and burns faster than originally designed. This can cause the airbags to explode violently and tear apart the metal canister designed to contain the explosion, sending deadly shrapnel throughout a vehicle. The airbags have already killed 16 people around the world, five of whom were in Malaysia. The Takata airbag recall, which began in 2008, has become the largest auto recall in U.S. history. The airbags were popular among car manufacturing giants Honda and Toyota. More than 69 million Takata airbag inflators have been recalled in the U.S., and more than 100 million have been globally. 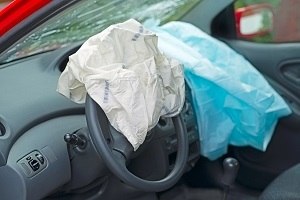 If you or a loved one has been injured by a defective Takata airbag(http://www.edwardslawok.com/takata-airbag-recall-lawyers.html), seeking legal representation is your best option for obtaining maximum compensation. Through a free consultation, our defective product attorneys will help you determine if you have grounds to file a claim. We work on a contingency fee basis and do not get paid unless you receive a favorable verdict or settlement.